This article is 2866 days old. Monday Evening was an historic night for the City of Windsor. Over 45 delegates spoke both for and against the Downtown Aquatic Family Centre & Library Complex Council taking almost four hours of the evening to hear them all. One resident Sarah Wilkinson told council that “The WFCU Centre was rushed in this exact manner, and has many flaws.” Others pointed to lack of community consultation, and the lack of it. A 400 name petition was presented to council from people living in the Glengarry Neighbourhood in support of keeping Water World open. Speaking in support were swim coaches and swimmers saying this complex will bring teams from all over to Windsor. 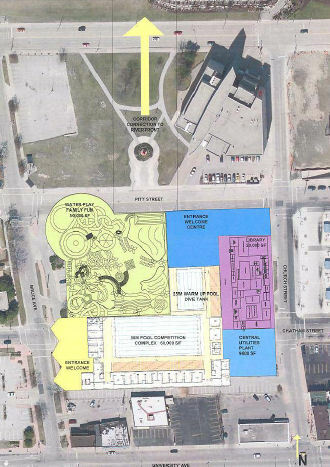 The Downtown BIA was also in full support of it, while the Wyandotte Street BIA was not. City Councillor Jo-Anne Gignac called this “dream project” and after almost seven hours of delegates and debate, at 12:50 am Tuesday, it was approved with a vote of ten to one with Alan Halberstadt voting against it.